It’s always lovely to ‘discover’ a writer new to me, thoroughly enjoy their book and then discover there is a back catalogue to catch up. 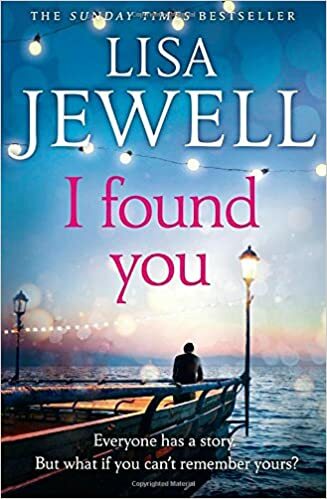 This is the first book by Lisa Jewell which I have read and it certainly won’t be the last. I must thank fellow bloggers Anne from Being Anne and Linda from Linda’s Book Bag whose excellent reviews encouraged me to pick up this book. Alice is a single mother whose life has been rather chaotic but who is now relatively settled in a cottage overlooking Ridinghouse Bay. Looking out her window one day, she sees a man sitting by himself on the beach. When he’s still there that evening, not having moved, and now soaking she goes to speak with him. The man cannot remember anything about himself or why he is there and Alice invites him to spend the night in the spare room she rents out. In Surrey, Ukrainian newly-wed Lily’s husband has failed to return home from work one night. At first the police aren’t interested but she knows there is something wrong. When the police do start to investigate Carl’s disappearance, they give her the startling news that his passport, the only ID she can find for him, is forged and that her husband isn’t who he said he was. Woven into the narrative is the story of a family who holidayed in the Ridinghouse Bay twenty years before and whose holiday ended in tragedy. Lisa Jewell writes in a way which kept me totally immersed in this story and wanting to read just one more chapter. She reveals information gradually, building up a picture of just what happened all those years ago and hinting at what the mystery man’s connection might be. He is christened Frank by Alice’s family and seems such a gentle man, but there could be a hidden darkness to him. Alice was a wonderful character. By her own admission, she has made some very poor choices in the past with regards to men and I couldn’t help but wonder if letting Frank stay with her was another of these choices. He didn’t seem like a dangerous person but he could have been anyone really. Despite this though, I couldn’t help but like her and her determination to do her best for her family, with the help of her good friend Derry. Lily was another character I warmed to. She was so young and so desperate to know what had happened to her husband. She had an air of vulnerability about her and yet was strong too. After all, not only had she only been married a few weeks but she’d only been in the UK that short time too. As well as dealing with her possible abandonment in a strange country, she had to be quite forceful in trying to track down her husband. Lisa Jewell was also brilliant at building up the suspense throughout the book. I was quite sure from near the beginning what I expected the ending to be but as usual I was wrong. The storyline led me to believe one thing and it was quite a surprise when I realised how cleverly the author had mis-led me! The chapters often ended with a revelation or cliffhanger which left me needing to read on and find out more about the mystery man and the vanished husband. With secrets, suspense, drama and love this is an excellent read and much darker than I had thought it would be. I highly recommend this book and am looking forward to discovering this author’s previous books.